Paden Kelley was a 6”7” 295 pound offensive tackle for the Texas Longhorns from 2009 until he quit the team in 2012 saying “After talking with my family and the UT staff, I have made the decision to take a step back from football in order to focus on family and other priorities in my life outside athletics”. He was Academic all Big 12. On March 18th, 2019 Paden passed away with testicular cancer There will be a memorial service for him on April 20th , 2019 . Link below shows more photos of Paden. KELLEY, Paden Castles Paden Castles Kelley, 28, a resident of Crested Butte, CO and a native of Austin, TX was born on August 7, 1990 and died on March 18, 2019. After graduating from Lake Travis High School in 2009, Paden played football for the University of Texas, completing his degree in 2016. After battling addiction in his early adult life, Paden became an active member in his widespread sober community. Diagnosed with cancer in December 2018, Paden successfully completed chemotherapy treatment just days before his tragic passing. His family and friends hope to create a kid's ski school scholarship in his honor. He is survived by his parents, Mary Beth and Scott Kelley; his sister, Kathryn Kelley; his wider Barber and Kelley families; and his created family of close friends. His life will be celebrated at Garden Grove in Buda, TX on April 20th at 2:00pm. Today I heard about Paden and I just couldn't believe it. I am so sad for Mary Beth and Scott. Almost one year ago In May of 2018 I reached out to Ashley Kamrath with the following question. Are you related to Karl and Bob Kamrath? Ashley Kamrath responded -" Yessir"
Ashley is a TV and radio personality who In November, 2013, won an Emmy Award for hosting the "Remembrance Rescue Project" documentary featuring Chicago Firefighters touring the country educating children on the significance of 9/11. In 2016, she won an Emmy Award for a documentary she produced entitled "Blood & Steel", while embedded with the 3rd Cavalry Regiment at the National Training Center in California. and Karl Kamrath is a National double Champions for the Longhorns . In addition, before Eugenie Sampson Kamrath Gonzalez married Karl Kamrath famed University of Texas tennis coach, Dr. D. A. Penick in 1931 dared to allow a woman to play tennis on the UT men’s Varsity tennis courts. She was the first woman player to be so honored. In 1932, 1933, and 1934, she was a finalist at the fledgling Houston Invitation Tennis Tournament which became the River Oaks Invitational Tennis Tournament—now the USTA Clay Court Championships. Upon moving permanently to Houston in 1937, she was the first teaching tennis professional at both Houston Country Club and River Oaks Country Club, starting active junior programs at each. Many of you may not know that the great golfer Ben Crenshaw has a brother that is part of Longhorn sports history . Charlie Crenshaw V is the brother of the great golfer Ben Crenshaw. Charlie played CF and RF for the Longhorn baseball team from ’70-‘73. During a game with Baylor their fans starting screaming at Charlie “Hey!!! How come you’re not caddying for your brother Ben?!?!? !” Charlie responded by hitting a home run and “saluting” the Bear fans with a profound universal gesture as he ran the bases. Author and former Longhorn football player R.E. Peppy Blount book titled Mamas, don’t let your babies grow to play Football tells the story of the friendship of Don Menasco and Bud McFaddin. Two Longhorn linebackers who had a special friendship with nothing in common except All American status. Bud had a loving family, football scholarship, and was assured of greatness. Don had no family, no football scholarship, and no signs of greatness. Bud was , quiet, polite, and large. Don was loud, irreverent, and small. Bud got all the media attention. Menasco got none but Blount says that “pound for pound Menasco was one of the hardest hitters to every play the game. More about their story is on the site. Donald Dean Menasco (October 18, 1929 – May 11, 1998) was an American football defensive back in the National Football League for the New York Giants and the Washington Redskins. He played college football at the University of Texas and was drafted in the fourth round of the 1952 NFL Draft. “Proliferation of rules and the development of increasingly sophisticated regulatory systems” are “ necessary to enforce those rules.” “Enforcement decisions, both economically and in terms of an institution's reputation ….., places great strain on the capacity of the NCAA to govern intercollegiate athletics. This strain is unlikely to dissipate in the future because the pressures that have created the strain do not appear to be susceptible, in a practical sense, to amelioration. Indeed, the one certainty in the future of the NCAA is the likelihood that big-time intercollegiate athletics will be engaged in the same point-counterpoint that has characterized its history; increased commercialization and public pressure leading to more sophisticated rules and regulatory systems”. As rules and regulatory systems continue… “ there will be increasing demands for fairness”. If the NCAA and those who lead at the institutional and conference levels are unable to maintain academic values in the face of economics and related pressures, the government may be less than a proverbial step away." AUTHOR KERN TIPS SAYS ABOUT RECRUITING “ FROM A CASUAL COURTSHIP, AND COMMON LAW MARRIAGE TO ARDENT, WELL-CHAPERONED ROMANCE, AND INDISSOLUBLE BOW. THIS MATING CALL IN FOOTBALL JARGON IS CALLED RECRUITING AND UNFORTUNATELY “ THE LAWS OF MAN HAVE HAD TO HUSTLE TO REIN THE LAWS OF NATURE”. In the beginning of college sports the athlete chose the University. In later years as the value of athletes rose in the esteemed eyes of the Universities, alumni emerged as recruiters. Alumni offered “inducements” for the athlete to attend their university. The incentive was not illegal. Even with inducements, the symbolic engagement ring was easy to return to the University if the student athlete changed his mind. In 1914 after the SWC was established there was a feeble attempt to stem the tendency of bribery. The SWC first rule stated that no one who had a degree could participate in college sports. The second rule required the athlete to attend the University for one year before becoming eligible to play football better known as the “Freshman rule”. CHRONOLOGY OF RECRUITING RULES TO STOP THE RAMPANT BRIBERY OF ATHLETES. 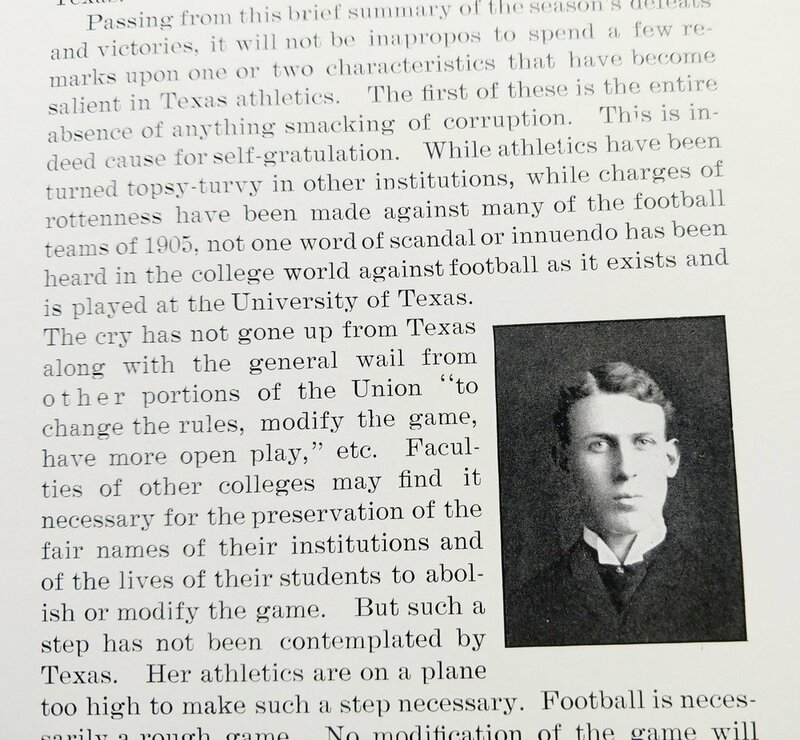 1905 article found in the “Cactus “ reflects one Longhorn sports writers perception of corruption in football and his antidote to solve the problem. Please form your own opinion of the authors resolution. 1909- "Cactus" states " the college (Texas) had stood square for clean athletics. On the roster...., there are no stars from the East and South. There are no hired mercenaries.... Though defeat has been her (Texas) portion, no disgraceful professionalism stains the fair name of Texas. Squarely she (Texas) has stood for all that is honest and manly--all that she seeks to teach the youth of the South. Proudly she (Texas) may look forward to a victorious future. " 1925 - The SWC passed the “tramp athlete” rule which stated athletes who transferred from one University to another did not qualify to play the same sport in another school. 1929 -The Carnegie Foundation for the Advancement of Education issued a significant report that warned that “Commercialism in college athletics must be diminished and college sport must rise to a point where it is esteemed primarily and sincerely for the opportunities it affords to mature youths”. That is to say education first and sports second. 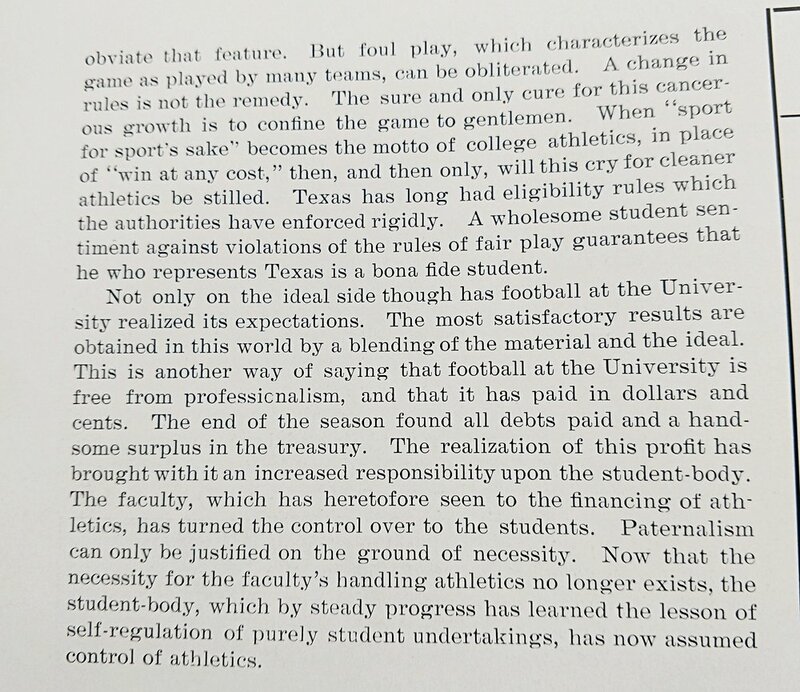 Up until 1930 “the sources of financial aid for the student athlete came from the alumni . More times than not the coaches and Universities administration did little recruiting. 1931- The SWC rules committee authorized some aid to the student athletes including providing jobs for the athletes to pay tuition, fees, room, board , and books. 1932- The coaches started to take over the responsibility of recruiting. 1935- The SWC adopted the Junior College transfer rule that allowed athletes to gain immediate eligibility at the chosen school. 1945- the NCAA pushes for more control over financial aid and recruiting. Many of the Longhorn athletes returning to campus after the WWII were focused on football more than academics Author R.E. Blount who played for the Horns from 1946-1948 said most were majoring in P.E. or Arts and Science and were taking a psychology classes to fulfill degree requirements. 1947- active Longhorn football scholarship player R.E. Blount is elected to the House of Representatives. The SWC received some complaints about him and chose to review Blount’s eligibility status. In 1946 Blount a starter for the Longhorns was a “principal” speaker on the high school speaking circuit. The SWC rule books says that only coaches could be a principal speaker in these type of events , so Bible makes Blount a member of the coaching staff even though Blount was also a scholarship player. The next year the Texas Attorney General was asked for an opinion on Blount status as a dual state employee receiving a salary as a member of the Texas House and a scholarship athlete attending UT. The opinion stated receiving income from the House of Representatives and financial support as a scholarship athlete was illegal, and Blount officially lost his scholarship, BUT Coach Bible allowed Peppy Blount to continue to live in the athletic dorm and maintained his dining room privileges at no charge. The G.I. bill paid for Blounts tuition and books. The case was settled and Blount finished his college career with no scholarship but most of the benefits. 1950-The first television sporting event in the 1950s was a college football game, and the NCAA maintained control of all televising rights for college football games. 1952 The legal “Letter of intent” between the athlete and a University dealt a legal death nail for athletes who changed their mind before attending their first class at the chosen university. The athlete who changed his mind suffered harsh consequences including loss of eligibility for two years and no scholarship for the other two years. In 1953 the date for signing recruits was changed to February 15th. Author Kern Tips says in his book the reason for the change was to “relieve the recruiting pressures on the innocent who were being bombard by those skilled salesmen (recruiters) ” hawking “a sheepskin-via pigskin”. In the early 1970s the members of the NCAA decided to create divisions, whereby schools would be placed in divisions that would better reflect their competitive capacity. 1973- As the NCAA’s “ enforcement capacity grew yearly in response to new excesses arising from increased interest and commercialization, the NCAA was beginning to be criticized for alleged unfairness in the exercise of its enhanced enforcement authority………. As a result in 1973, the NCAA adopted recommendations…. “dividing the prosecutorial and investigative roles of the Committee on Infractions." 1978- the United States House of Representatives “held hearings to investigate the alleged unfairness of the NCAA's enforcement processes. Once again, the NCAA responded by adopting changes in its rules designed to address many of the criticisms made during the course of the hearings. While concerns were somewhat abated, the NCAA's enforcement processes continued to be the source of substantial criticism through the 1970s and 1980s”. In the 1980’s “University presidents increasingly found themselves caught between the pressures applied by influential members of boards of trustees and alumni, who often demanded winning athletic programs, and faculty and educators, who feared the rising commercialization of athletics and its impact on academic values. Many presidents were determined to take an active, collective role in the governance of the NCAA, so they formed the influential Presidents Commission in response to these pressures”. 1984- “The University President’s Commission began to assert its authority and called a special convention to be held in June of 1985. This quick assertion of power by the President’s of the universities led one sports writer to conclude that ‘There is no doubt who is running college sports. It's the college presidents."' “Over time, however, the presidents were gaining a better understanding of the workings of the NCAA, and they were beginning to take far more interest in the actual governance of intercollegiate athletics. 1991- Chief Justice of the United States Supreme Court Warren E. Burger, issued a report suggesting new procedures for the investigation process for infractions. The purpose of the review was to “make sure that the process is handled in the most effective way, that fair procedures are guaranteed, that penalties are appropriate and consistent”. 1994 - The University president’s involvement with the NCAA had grown to the extent that they had changed the very governance structure of the NCAA, with the addition of an Executive Committee and a Board of Directors for the various divisions, both of which are made up of presidents or chief executive officers. Recruiting student athletes slowly morphs into a research laden process requiring full dossiers on each potential student athlete, but recruiting mistakes are still made. Abe Lemmon once said “doctors bury their mistakes, but mine (recruiting) are still on scholarship”. Coach Lemon concedes that “it’s the worst part of coaching”. The annual search for high school talent is one of the most pressure filled parts of college sports. Recruiters can’t read the players mindset so they make decisions based on the high school athletes past performance including agility, performance, and quickness. It is the intangibles where most recruiting mistakes are made. Many great athletes just lose interest in the sport. It can be caused by homesickness, a girlfriend at home, or just sports burn-out. In 1978 Booger Brooks from Andrews was a great running quarterback who Coach Freddie Akers needed for his offense. Brooks signed with Texas, but he packed up his car and went home before he ever took a snap in a game. His heart was not in football. He loved the rodeo and wanted to be a welder. Akers tried unsuccessfully to talk Brooks out of leaving UT, but he left the game with the comment “People were just a lot more serious about football than I was. To me it was always just a game”. Others leave the program because of timing issues. Mike Presley was a great athlete who could have started for many other football programs, but Mike had to compete against Marty Akins. Mike never got the starting job so he left the Longhorn program his senior year. While Priest Holmes did graduate from Texas he was in the same position as Mike Presley. After suffering an injury, Priest was Heisman trophy winner Ricky Williams back-up. However, the primary intangible that recruiters cannot judge is a players ability to adjust from home life to college life. Many athletes are unable to adjust to all the freedoms and responsibilities of college. Immaturity, poor role models, bad study habits, lack of discipline, little foresight, inspirational and motivational deficiencies, and alcohol abuse result in a loss of a free education. Author and former Longhorn football player from the 1940’s R.E. Peppy Blount book titled Mamas, don’t let your babies grow to play Football Blount question is still relevant in 2019, “ How does one quell the recruiting abuses of the paunchy, overzealous alumnus, whose fool brains, understanding — and ability in most instances— never got any higher than their stomachs”? 1) In the early 30’s Tex Robertson won the national championship as a swimmer at the Junior College level. He then received a scholarship offer to USC as a freshman and then transferred to University of Michigan to swim and was once again listed as a freshman. The NCAA finally caught up with Tex, and he was ruled ineligible to swim for Michigan during the 1936 season. 2)When Tex Robertson took the head swimming job at Texas in 1935, he had no scholarships to offer swimming athletes , but he still offered scholarships to some of the best swimmers. “Tex solution was to pay for as much of the Longhorn swimmers’ scholarships as he could with his own money. Admirable but clearly not allowed under NCAA rules. Coach Reese the present Coach of the Longhorn swimmers said Tex help was “morally fine, ethically fine but NCAA’-LY , he was a dead man”. Fortunately the NCAA in the 30’s was still not enforcing many of the rules the institution implemented, and Coach Robertson was not punished. 3) Joey Aboussie was an All American in high school and many universities were “bidding” for his service under the table, but he still chose Texas with no bribes offered . Joey says most of the bribing came from the alumni not the coaches. Joey like many other recruits said he was not prepared for the pressure put on him to sign from recruiters. 4) In the early 60’s Ernie Koy was heavily recruited by universities across the nation. One recruiter came to his house and volunteered to help him slop the hogs at sundown on his father’s place hoping that this work would convince Ernie of their sincerity to “help” him . Ernie says “ I never met a nicer bunch of gentlemen “. Ernie signed his letter of intent with Texas and learned very quickly that the honeymoon was over. The recruiter’s who wanted to tuck him in at night and loved his parents changed dramatically. No more sweet talk for Ernie from the coaches. It was a time to earn and learn. Todd Dodge says “One of the things we try to tell our (high school) players is don’t let anybody take your joy away during the (recruiting) process. Players were given 2 complimentary tickets and the option to purchase 4 more all on the 50 yard line. Most players opted for the six tickets with the intent to sell the tickets to corporations and wealthy alumni. Unfortunately scalping tickets was banned by the SWC in the late 40’s which resulted in objections from some prominent members at the University level. Clemson’s Athletic Director reasoned that if it was ok for the student body to scalp their tickets , it should be alright if athletes yo do the same. Coach Bear Bryant said when he was at college scalping tickets paid for “ toothpaste and shaving cream” and various other necessities. For many of the players from poor families, this extra money helped then with incidentals and even dating. From my own experience playing in the the late 60’s, I know the players in this era were scalping tickets so the 1940 SWC ruling against scalping must not have never been enforced. The battlefield for the fruits of winning games begins with signing great recruits . Coach Akers inherited a program at a time when The SWC was losing the battle to remain relevant and competitive with other conferences. In Fact, In 1980, 1986, 1988, and 1989 there were no SWC Teams in the final top 10. The great Texas high school football athletes were leaving the "boring" SWC for more "exciting" football venues, and many SWC teams resorted to desperate means to survive - including illegal recruiting, dirty money, and predatory tactics. Only Rice, Baylor and Arkansas escaped the eyes of the NCAA in the 80’s. After a 18 month investigation UT is accused of violating 19 NCAA rules from 1980 - 1986 . Texas received some minor sanctions for giving players small loans of $10- $50, loaning cars to players, and selling complimentary tickets. Akers said " These violations are an accumulation of small things over a long period of time that could happen almost anywhere you have a major program." 25 players lose some or all of their complimentary tickets for selling them to make money. Stealing a lollipop is not as significant as stealing a car, and in this analogy Texas stole a lollipop and SMU stole the car. SMU chose deceit over compliance to recruit great athletes to fill their coffers. Fortunately, for the integrity of college sports, SMU was caught and punished with the “death” penalty. Naturally there were a lot of Longhorns complaining about how minor the infractions were. Ken Hackemack the UT defensive tackle said “ I think the NCAA is making the S.W.C. into the scapegoat for violation accusations. It is very ridiculous to punish SWC teams when most other schools are making the same or worse violations. Almost everyone does it. It is hard to avoid. 4 weeks earlier SMU received the "death penalty" from the NCAA. SMU in the 80’s chose deceit over compliance to recruit great athletes to win games and fill their coffers. Fortunately, for the integrity of college sports, they were caught. The NCAA rightfully punished SMU with the death penalty. Bryan Millard labels the Texas-SMU game as competition "between a couple of jailbirds." 1) 1987 Eric Metcalf is in violation of an NCAA rule. He receives room and board at Jester Center during the summer, but he does not attend school. The punishment is a one game suspension for Eric. He misses the BYU game and Texas loses 47-6. 2) In 1995 Texas Wins The SWC Championship With A Scholarship Player Who Has No College Eligibility. Ron McKelvey (Ron Weaver) Plays In all 11 Games At Texas. His Mother And Father don’t even know He Is On The Texas Team. Federal Prosecutors Charge Ron With "Fraudulent Misrepresentation" And Misuse Of a Social Security Number. The Result- No NCAA Infraction for Texas And Ron reimburses Texas $5000 For The Cost Of The Scholarship. 3) Texas gets probation without sanctions for buying Marcus Dupree's new boots . Unfortunately, Winning, power, and money still lead to Corruption in college sports so the NCAA, with all its flaws, is still necessary to both investigate and enforce sanctions. the hide and seek of recruiting violations will always find new beginnings to a never ending story.